Sorry... the 2017 Lexus ES 350 is no longer being sold as new. Instead, take the first step to a great deal on 2019 Lexus ES 350 with a free price quote! 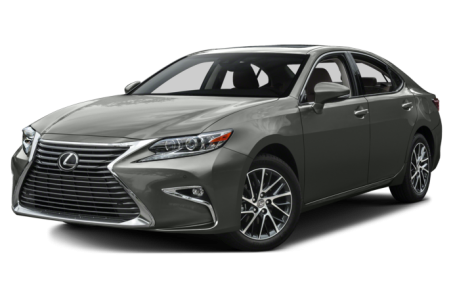 The 2017 Lexus ES 350 is a mid-size luxury sedan that seats 5 passengers. It competes with the BMW 5-Series, Mercedes-Benz E-Class, and Genesis G80. A more fuel-efficient ES 300h hybrid version is available and will be covered in a separate overview. This year, the ES 350 remains largely unchanged. The ES 350 has tamer styling than most Lexus vehicles in the lineup. It has simpler body lines and plainer-looking headlights and taillights. However, it does feature a large, one-piece “spindle” grille for visual interest. Standard features include LED headlights, 17-inch alloy wheels, a power moonroof, and dual exhaust tips that are integrated into the rear bumper. Under the hood, the ES 350 keeps the same engine option as last year – a 268-hp, 3.5-liter V-6 that is mated to six-speed automatic transmission and front-wheel drive. Fuel economy estimates remain the same: 21/31 mpg city/highway. The ES 350 sits on the same platform found under the Toyota Avalon, which gives it a ton of interior space even for rear-seat passengers who will find plenty of leg and hip room that will keep them comfortable even on longer journeys. Standard interior features include leatherette upholstery, power front seats, dual-zone automatic climate control, 7-inch touchscreen with a controller for the audio system located between the front seats, USB port, Bluetooth connectivity, and HD radio. A navigation system, heated front seats, real leather upholstery, and Lexus Enform Remote are optional. Lexus Enform Remote gives smartphone control over many of the ES 350’s functions to the driver; you can start the car remotely, lock and unlock doors, locate where you parked it, and check the fuel levels, all from your phone. Safety System+ Package now comes standard. It includes pre-collision warning, lane departure alert with steering assist, intelligent high beams, and adaptive radar cruise control, which works at speeds over 25 mph. Other standard safety equipment includes a rearview camera, ten airbags, antilock brakes, and electronic stability control. 34 of 36 (94%) consumers said they would recommend this vehicle to a friend.